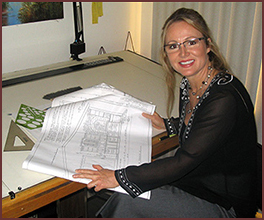 Laura Wireman has been involved in design and construction since the 1980’s when she codesigned and assisted in the building of a unique Adobe Hacienda in the rolling hills of San Diego’s North County. Her deep appreciation of personalized, functional, and aesthetically pleasing living spaces (whether inside or outside) inspired her to seek a professional education in the field of Interior Design. Laura is an active member with local design groups and is a professional Allied ASID member. As an Allied ASID designer, she has the extensive educational training and ‘on-the-job’ experience to expertly manage all the details of your design project. Through the use of innate creative visioning, advanced technical skills, and the highest level of integrity and professionalism, Laura Wireman will assist you every step of the way in creating truly unique and expressive solutions for all your design needs.